Published: March 12, 2013 at 01:41 p.m. Updated: March 14, 2013 at 04:28 p.m.
Notes: Salary-cap implications prevented the Texans from slapping Quin with the tag. He could now be the most coveted safety on the market at age 27 with no major injuries on his record. ... Goldson has been seeking $8 million annually, a number at which the 49ers have balked the past two offseasons. There's not much separating Goldson from Quin beyond a two-year age disadvantage. Notes: Phillips still demonstrates difference-making ability when he's on the field, but his surgically-repaired knee represents the biggest injury red flag on this list. If healthy, though, no available safety has a better chance of turning in an All-Pro season in 2013. Reed's play slipped noticeably for the first time last season, but it was coming down from a Hall of Fame level. Injuries were certainly a factor. Any team signing him must take a season-by-season approach at this point. ... Delmas' troublesome left knee has kept him out of 13 games the past two years, leaving his Detroit future in doubt. The Lions' willingness to let him test the market augurs ill for his chances of landing a big contract. Notes: New Jaguars general manager David Caldwell believes it will be "tough" for Woodson to land a starting job after the Packers cut ties with him. Scouts wonder if Woodson's ego can handle situational work as a role player as opposed to the defensive leader. Look for a contender to roll the dice on the future Hall of Famer. ... The ageless Barber enjoyed a Pro Bowl-caliber season in his first experience at safety after his cornerback play slipped significantly in 2011. He would be higher on this list if I truly believed he would play for any team other than the Bucs. ... Clemons has been a league-average starter in 2010 and 2012 with an injury-marred season sandwiched in between. Notes: One of the NFL's worst starters in 2011, Sanford got a boost from playing alongside rangy rookie Harrison Smith last year. ... Coming off a patellar tendon tear, Leonhard was eased back in as an effective subpackage player in Denver last year. That may be his ideal role. Lynch held his own opposite Eric Weddle down the stretch after taking over for an injured Atari Bigby. ... If forced to play starter's snaps, Bell, Williams and Elam have reached the stage of their careers where they are hurting a defense more than helping. 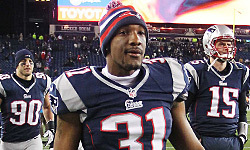 ... Martin lost his job in 2012 after missing too many tackles and giving up a slew up big plays in 2011. His market will be soft after tearing his ACL and MCL in December. Beyond Byrd, Quin and Goldson, there's quite a boom-or-bust market. Phillips, Delmas, Moore, and Landry are perhaps as talented a foursome as any group of safeties in the NFL, but their collective injury history is downright scary. All four could have heavy suitors even if the floors are as low as the ceilings are high. Reed, Barber and Woodson can still help a contender while on the downside of their careers. It's likely that Reed and Barber will return to Baltimore and Tampa respectively, leaving Woodson as a key puzzle piece for teams in the Lombardi Trophy hunt. Borderline starters such as Leonhard, Bell, Williams and Elam can be signed as veteran insurance for teams targeting a bumper crop of safety prospects in April's draft. New York Jets: The top three safeties from 2012 are all free agents. Detroit Lions: Delmas will hit the open market, and Amari Spievey's NFL future is in doubt due to concussions. Philadelphia Eagles: The Eagles' secondary hemorrhaged big plays last season. Carolina Panthers: Similar to the Eagles, the Panthers' safeties were burned too often a year ago. They could use upgrades at both spots. Houston Texans: There's a vacancy opposite Danieal Manning now that Quin won't be back. Washington Redskins: The back end was the biggest weakness on the defense last season. Baltimore Ravens: The Ravens need to keep Ed Reed from leaving for Indianapolis or New England. Cincinnati Bengals: Reggie Nelson needs a running mate. Atlanta Falcons: The Falcons have no one ready to step in if Moore leaves for a bigger payday. Dallas Cowboys: Safety is a perennial need in Dallas despite the large piles of cash thrown at the position. Green Bay Packers: Unless the Packers are comfortable with Jerron McMillian, a veteran starter is needed opposite Morgan Burnett. San Francisco 49ers: : Free safety will have to be addressed with Goldson gone. St. Louis Rams: Craig Dahl wasn't the answer opposite strong safety Quintin Mikell.